Ragtime Chord Progressions - What is A Turnaround ? In this brief ragtime blues guitar lesson, I take a glance at the ragtime chords often played in between verses in a standard ragtime tune. When starting to learn blues guitar chords, it's important to be conscious of the techniques that give this great music it's particular flavor. Composition Of The Turnaround In C.
In the early 1900s, a style of guitar playing made well known by traveling medicine shows became known as 'ragtime blues', or usually it was named 'Piedmont Blues'. The bouncy, joyful sound contrasted considerably with the slower, more somber feeling of the delta blues, which was generally performed in E, A or open tuning. 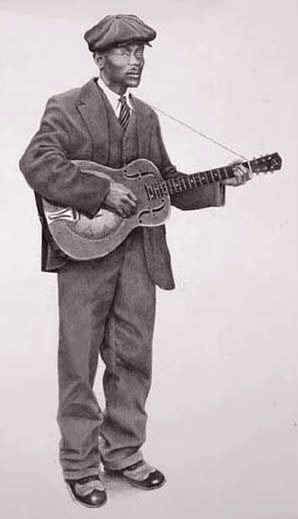 Ragtime guitar pieces, whose words were typically barely disguised sexual references, were performed really effectively by some performers, notably Blind Blake, Reverend Gary Davis (who could perform in any style), Pink Anderson, Sam Chatmon, Blind Willie McTell, Hacksaw Harney and Blind Boy Fuller. Various performers, like Big Bill Broonzy, touched on the ragtime feel, but had a significantly broader range. Often these tunes were performed in the keys of C, G and D, which lend themselves to the alternating bass picking structure common in this music. As you pay attention to a ragtime song, a couple of things may possibly strike you. First of all, they tended to play at a great pace, which is typically testimony to the skill and precision of the players. Secondly, there are typical structural elements connecting tunes in a similar key, which is not too astonishing. One of these elements I call the 'turnaround' - that short progression of chords that is performed between two verses. It supplies breathing space between separate sets of words, offering space, creating tension and additionally offering a chance for the guitarist to present his skills. A video replaces a 1000 phrases of explanation, but I'll quickly go through the chords here (the video below should put the icing on the cake.) You may just strum these chords before trying the picking sample I perform for you later on. Once ending a verse, we start the turnaround with a standard C chord. As you will see, I don't fret the first bass string - my reasoning is (almost) every time 'if you don't pluck the string with your picking hand, don't fret it with your left!' This will get clearer in the video. After that we move on to F. Remember - if I'm solely plucking the last 4 strings, then I won't bother fretting the others. This permits for more pace and flexibility, but we want to ensure that our right hand palm retains contact with the strings that are not fretted. If not, these strings may vibrate and generate unpleasant discordant noises. It's fairly rare for me to play a full F chord. Usually I'll not fret the 2nd bass string and fret the bass E with my thumb. This configuration frees up the small finger of my fretting hand to move around on the treble strings. Hold down Ab7 with your fore finger barring the first four strings, and your ring (or little) finger, to fret the high E on the 2nd fret. Practically there - not challenging at all is it? One more chord to complete the turnaround. Immediately after the Ab7 chord we move back to the simple C chord and then to G to finish off the sequence. The entire chord sequence is as follows C-C7-F-Ab7-C-G , moving again to C once we start out singing the following verse. These are typical ragtime guitar chords found in many songs of this genre. This basic chord structure holds many possibilities, and we look at a few of these in the video clip underneath the text. This quick lesson features Blind Boy Fuller's traditional song 'Truckin' Little Baby' to illustrate just one way of playing this turnaround in the key of C.
There are many variations of this piece played by various guitarists, who use similar picking patterns. When starting to learn how to play blues, it's excellent to be conscious of the terrific subtleties these artists left us, and pay homage to their genius and way of living. Play around with the structure, add it to your own personal collection of tricks and incorporate it into your playing - enjoy!